Boxycharm Reviews: Right Beauty Box Subscription for You? 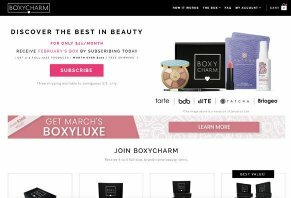 Boxycharm is a beauty subscription box that provides you with five full-sized beauty products each month, with options to upgrade your subscription for bonus products. Boxycharm Review: Right Beauty Box Subscription for You? Boxycharm is a subscription beauty box service that provides you with 4 or 5 full-sized beauty items each month for about $21 per month. Skincare products, makeup, and other beauty tools are all fair game, and the company states that each box has a minimum retail value of at least $100. Beyond each box, Boxycharm subscribers gain access to exclusive, members-only offers for top beauty brands. They can also earn reward points for redeeming additional products, and have the opportunity to win free products from brand giveaways. How else does Boxycharm stand out from other beauty box subscription services? Let’s look closer at this company to find out. If you want to try out Boxycharm for yourself, a month-to-month subscription costs $21 per box. The plan gets cheaper the more months you commit to, from $19.66 per month ($59) for three months, $19.33 per month ($116) for six, and $19.25 per month ($231) if you pay for a full year. These charges are nonrefundable. Boxycharm offers free shipping throughout the continental United States with varying rates for international shipping. As with most subscription companies, Boxycharm subscriptions automatically renew unless you cancel it before your current subscription has expired. You can cancel your subscription at any time by logging into your account and editing the “Subscriptions” setting in “Account Preferences.” This change will be applied to your next billing cycle, and you won’t be refunded for any purchases you have already made. In situations when you receive a broken or damaged product, you can request a replacement by sending Boxycharm an email within 14 days of receiving your box that includes a picture that shows both the damage and the shipping label. You can direct further questions to Boxycharm at their contact page. The Boxycharm brand offers incentives for subscribers to review their products and recommend them to friends through their ‘Charms Program.’ Each product review and subscription referral earns subscribers a set amounts of ‘charms’ that can be used as currency to purchase products in the Charms Shop. At the time of writing, 1,000 charms equaled $10, and subscribers earned 500 charms for friend referrals and 50 charms for product reviews. Most of the items within the charms store are priced between $10 - $30. For Boxycharm subscribers that want to boost their benefits, the company offers an upgrade to their standard boxes that is known as BoxyLuxe. This subscription upgrade is only available every three months (March, June, September, December) and you need to be an existing subscriber to purchase it. BoxyLuxe promises to deliver you at twice the amount of curated, full-size brands per box, bringing the total value to over $250. This specialty subscription box costs $28.99 in addition to your existing subscription cost, and you can cancel the service at any time, no questions asked. This premium box is only available in limited quantities each month, so we noted numerous complaints from subscribers who wanted it but had to get on the waitlist for the next order. The best way to compare different beauty boxes is to see what previous customers thought of them. Boxycharms’s Facebook page offers glowing reports of subscribers’ opinions of each box. We noticed how much reviewers appreciated receiving full sized products instead of sample sizes in their orders and that they consistently found several products they loved in each order. Repeatedly, Facebook reviewers mentioned how great of a value they thought their boxes were. Though many reviewers noted that certain products weren’t their color preference, they still said that they were impressed overall with their quality and brand names. Many also mentioned that the variety between months was good, meaning that they never knew what to expect inside when they opened each box. Notably, a handful of subscribers said that the boxes weren’t inclusive for women of color and that they offered too many products that only worked for white skin. We also noticed some complaints about customer service and their slow response time to questions. This matched our experience, as our numerous requests for comments only received automatic responses. Influenster reviews of Boxycharm reach similar conclusions. Reviewers repeatedly noted that their boxes were full of high-quality products that were a higher value than what they paid, but that the colors of foundations, brow liners, and lipsticks were far from their preferred shades. Others mentioned that they still felt excited about each new box after subscribing for six months or longer and that they canceled other beauty box subscription services (Ipsy was referenced repeatedly) to use Boxycharm instead. Regarding the BoxyLuxe option, most of the reviews we saw on both Facebook and Influenster showed that subscribers were happy with the products they received. However, many were upset that they weren’t able to order BoxyLuxe because the company often ran out of product and couldn’t provide the upgrade for everyone who requested it. Considering the fierce competition for beauty box subscriptions today, does Boxycharm differentiate itself well? This chart compares it to a few other services to help you see how it stands out. From this chart, it’s clear that Boxycharm is on the more expensive side for a subscription beauty box, but it is also the option that guarantees you full-size products. The total value of each box is also the highest of any brand we looked at. Receiving full-sized products might be a mixed blessing though, as there are fewer options with Boxycharm to customize your order and you might be left with some large products you never want to use. Glossybox is a direct competitor to Boxycharm that also costs $21 per month. As with Boxycharm, most Glossybox reviews are positive in regards to the overall product selection, but most negative reviews are related to missing boxes or problems canceling subscriptions that auto-renewed without the customer being aware of it. According to the comments from subscribers who have used both brands, Boxycharm boxes tend to primarily contain makeup products, while Glossybox branches further into skin and hair products. Likewise, Glossybox offers more options to state your product preferences, though there’s no guarantee that they will be followed with every order. Our View: Should You Try Boxycharm? According to our research, Boxycharm has positioned itself as a solid option in the beauty box market. While you’ll pay slightly more per box than many brands, the company sets itself apart by offering full-sized products in every order instead of “deluxe” sample sizes that are common with the competition. While we did notice some negative reviews about the boxes not being inclusive enough for women of color, many subscribers seemed willing to give this lack of personalization a pass because each product they loved compensated for the misses. There are some listed concerns with slow customer service, so that might be something to keep in mind if you’re concerned about canceling your order or if you live in a region where you frequently have mail delivery problems. It’s also crucial to note that each Boxycharm subscription will automatically renew during the last month unless you change your account settings to cancel it before a set date. In other words, a “three-month” subscription won’t stop after three months; you’ll instead be billed for the next three months near the end of the third one. Notably, gift subscriptions don’t renew once they expire. If you’re concerned about getting stuck with a subscription you forget to cancel, it might be best to “gift” yourself a subscription as a trial run instead. If you’re interested in seeing whether a beauty box subscription makes sense for you, we think that it makes sense to give Boxycharm a try. While you might get stuck with several full-sized products that you’re not interested in, previous customer experience shows that the odds are good you’ll still find a few products you love in each box. Write a Review for Boxycharm!